Here is an opportunity for you to take ownership of the heart of my Longhorn herd. Until May 1st I am offering to sell 5 of my best cows for a total of $10,000.00. 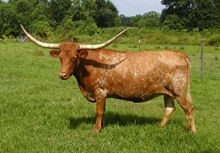 They are all own daughters of legendary bulls in the Texas Longhorn breed. Just think of how nice it would be to own a daughter of Farlap Chex, one of Over Kill, one of Safari BL Chex, one of JP Rio Grande and one of Heads Up. If interested, study their pedigrees and look at their pictures. Then, if still interested, contact me for any other information that I can provide. If you want to build a herd with top flight genetics, do not pass up this offering!